Handmade holidays are so much fun. You can crochet everything from the table linens for your Christmas dinner to the gifts that you give everyone in your life. And, of course, you can crochet your home decor. 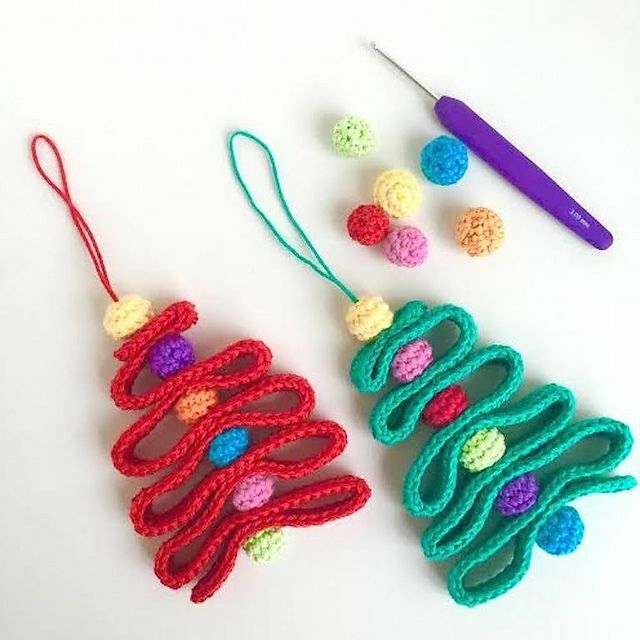 Specifically, you can add something unique and special to your Christmas tree with handmade crochet ornaments. Once you have made these, you'll want to take them out again year after year to fill your home with the crafty love that went into making them in the first place. What a great way to bring your skills to the season! You can also gift individual ornaments or sets of ornaments to others to add something warm and fresh to their holiday as well. Here are twelve free Christmas ornament crochet patterns to get you started! 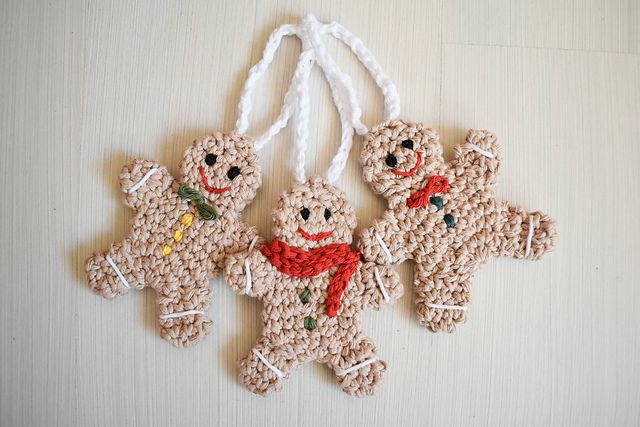 Simple crochet stitches are perfectly shaped to create the quintessential gingerbread man to adorn your tree. Use bits of colorful scrap yarn to create the buttons, scarf and other details that make this crochet ornament so cute. This precious crochet mitten ornament doubles as a gift card holder so that you can adorn the tree with extra little gifts for everyone this year. The bonus is that the crochet snowflake appliqués also makes a great small tree ornament all on its own. Originally designed as a gift topper to give a personal touch to your presents, this crochet wreath is also a great choice for an ornament to hang on your tree. Flat appliqués like this also work well as bunting or attached to larger crochet items, making this a highly versatile Christmas design. This little crochet Christmas tree crochet pattern is one of the most unique holiday crochet patterns out there. It uses basic crochet stitches, assembled in a fun way, to create a graphic, adorable ornament! This will stand out on any tree. You don't have to make an entire ornament from scratch; you can use crochet to create a cozy to put around store-bought ornaments. This is a great way to upcycle all of those baubles that you have in storage! This particular example is thread crochet cozy featuring a lacework design that allows the underlying ornament to shine through. This is another example of a crochet cover that fits over existing ornaments. It's a free crochet pattern made with a hint of granny stitches, giving the design that classic twist that is perfect for the holidays. This is a great stash busting crochet project; use up all of those yarn scraps to make a set of colorful ornaments! Build your colorful crochet stitches around a styrofoam ball to create a beautiful crochet bauble to hang from your tree. This crochet tutorial comes with tons of photos and step-by-step instructions, so it's a good choice for beginners. Dress your Christmas tree up in crochet teacups for a unique theme that has romance, whimsy, and charm. These small crochet teacup ornaments have pops of gold thread that add a holiday element to the pretty colors of the cups themselves. Characters are what make the Christmas holiday so playful and fun. Reindeer, elves, and snowmen make us smile all winter long. That's why they make such great designs for ornaments, as you can see with this crochet snowman pattern. The little details in the face and hat are what really make this pattern pop. Here's another cute crochet character that makes an adorable ornament. It's Pip the Crochet Mouse, a free Ravelry download by Corina Cook. The Christmas Mouse book is just one example of a holiday story that incorporates mice; they're a fun little feature of the season! Angels are another great symbol of the winter holidays, and they make great decorations for any Christmas tree. This is a free crochet pattern for an angel that could also work as a holiday garland. To make the garland, you would crochet a big set of these and string them together along a crochet chain for a beautiful decoration. Christmas is also definitely about sweets and treats, and candy canes are the best of all of those. Here's a free crochet pattern, available as a Ravelry download, for a candy cane Christmas ornament. This pattern is cute as a tabletop ornament as well as one that can be hung from the Christmas tree. This is also a perfect gift to give to anyone—or an accessory for the outside of another gift that you've wrapped.